Australia will go ahead with a large-scale solar PV project in New South Wales state to be undertaken by solar panel manufacturing giant First Solar, and gas retailer AGL Energy. One of First Solar's projects. 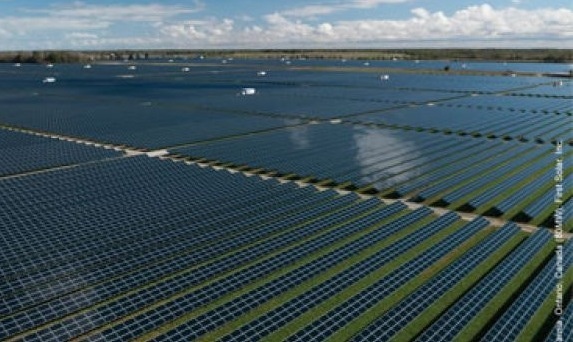 Image: First Solar Inc.
Australian federal government awarded a $130 million grant to AGL Energy and First Solar to build the 159 MW grid connected solar power stations. The A$450million (US$446 mil) renewable energy project will be built at two sites - Broken Hill and Nyngan. Sydney Morning Herald reported that Energy Minister Martin Ferguson reopened first-round bidding in February after the consortium behind the initial winner - the Moree Solar Farm - proposed major changes to its project and failed to meet a December deadline to secure financial backing. Mr Ferguson on Saturday (June 9) said the 159 megawatt project in Broken Hill and Nyngan represented excellent value for money and would ensure Australia brought industrial-scale solar power to market. The energy minister said a rigorous assessment process by the independent Solar Flagships Council found the AGL-First Solar bid had the highest level of merit overall "representing value-for-money, low risk and high commercial viability". "At the end of the day it all comes down to cost and if large scale solar is going to succeed in Australia it has to be cost competitive," Mr Ferguson said in a statement. But he noted all short-listed applicants, including the Moree Solar Farm, TRUenergy and Infigen-Suntech bids, were of "high merit" and would be referred to the new Australian Renewable Energy Agency for future funding consideration. Great move by Australia. Remember this country is one of the major producers of the 'dirty' coal and in terms of consumption it is in the top ten countries. Australia made the move to spend more in producing energy from cleaner source. They are focused towards becoming 'net user' compared to Malaysia which seems to be aiming at becoming major producer of the solar panel itself. First Solar has solar PV manufacturing plant in Kedah, Malaysia but has since scaled back production due to deteriorating demand in European market. I think we should increase solar panel usage domestically rather than depending too much on export. Get the state governments to contribute to the FIT fund coffer and revise the quota for both individual and non-individual rooftop/solar farm installations. Create domestic market for panels you produce locally. What message are you sending to the world when you produce a lot of panels but you yourself don't use them? After seeing the solar panels at Perhentian Island i was wondering whether they are durable enough. @thomas - Ouch! Now,that makes me wondering, too. I hope it's a case of non-maintenance rather than the durability issue of the panel itself.